At Harry & David, we have always believed in offering premium coffee meant to be savored and shared. That's why we came up with the Moose Munch® Coffee Sampler. 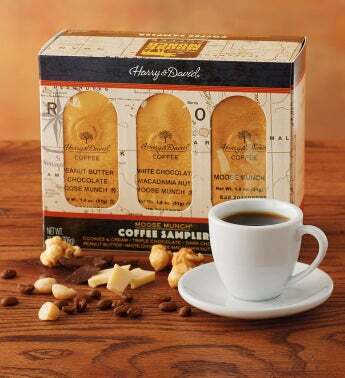 Inside the exclusively decorated gift box are six flavors of pre-ground decadent Moose Munch® Coffee, including triple chocolate and dark chocolate cherry. Every sip will treat the senses to the sweet, salty Moose Munch® Premium Popcorn flavors combined with the dark, rich taste of the best Arabica coffee beans.